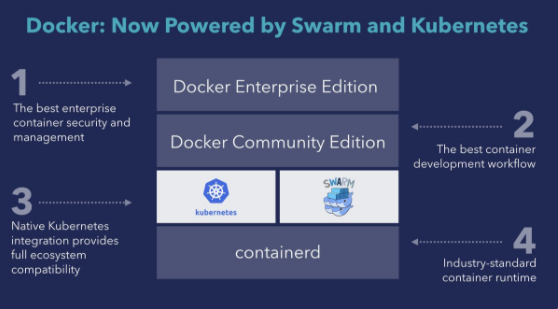 Docker announced support for Kubernetes, making the container orchestration platform a full citizen alongside Docker Swarm as a deployment target. Docker announced support for Kubernetes, making the container orchestration platform a full citizen alongside Docker Swarm as a deployment target. The keynote demo was pretty sweet – showing how a Docker user really didn’t need to make a choice any more about which orchestrator to use. Docker’s decision to offer native support for Kubernetes makes obvious sense from both a business and a technical perspective. Kubernetes is crushing it – it is now the defacto standard for container orchestration, given support from pretty much the entire vendor industry from Amazon Web Services, to IBM, Google, Microsoft, Oracle, Pivotal and Red Hat. Given that Kubernetes is the platform being chosen for deployment and operations it is also where the money is going to flow. Docker couldn’t afford to shut itself from the business opportunity. It has to be galling to be the company that kicked off the container revolution, only to see Red Hat emerge as a competitor with OpenShift, because of its Kubernetes story, packaging expertise and customer footprint. Lately Pivotal has thrown its hat into the ring with Pivotal Kubernetes Services.